The call menor, created in 1257, is located outside the walls, along the present carrer Ferran. On the site of the synagogue, the church of St. Jaume was built in 1595. This district underwent profound changes in the nineteenth century, and there remains today no trace of a Jewish past. The cemetery is listed since 1091 on the hill of Montjuic, name whose origin isn’t known (perhaps “the Mount of the Jews”). On its site stands today the Olympic Stadium. In 1945, excavations made it possible to find some thirty tombstones, exhibited at the Military Museum installed in the old castle, as well as four rings and earrings on display at the City’s Historical Museum. It is also known that Jewish vintners produced kosher wine at this location. Records of the cemetery of Montjuic, a name of uncertain origin (possibly “Jews’ Mountain”) go back to 1091. Today, the site is occupied by the Olympic stadium. In 1945, excavation brought to light some thirty headstones, now exhibited in the Military Museum (Museo Militar) housed in the old castle, as well as four rings and earrings that can be seen in the city’s Historical Museum. You will find fragments of Hebrew inscriptions on the houses of Carrer Montcada and Condes de Barcelona. 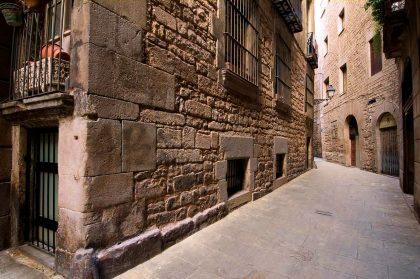 On the Plaça del Rei, where the first autodafé of the Inquisition took place in 1488, stands the Palau Reial Major: it was in one of its rooms that the famous controversy between Nahmanide and pau Cristiani took place in 1263 , in the presence of King Jaume I. On the other side of the square, the archives of the Crown of Aragon preserve a precious and vast documentation on the history of the life of the Catalan Jews; there are also the remains of a tombstone of Montjuic. The old synagogue, or major synagogue of Barcelona is in the old medieval Jewish quarter. 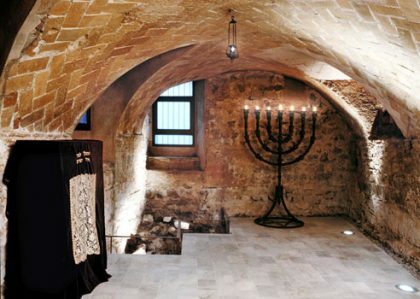 The building dates from the 6th century and is to date the oldest synagogue found in Spain. The building’s foundations date back to Roman times and you can see remnants of this past on the interior walls of the synagogue. After the sacking of the Jewish quarter on August 5, 1391, the building passed into the hands of the king, and, little by little, its original function and location were forgotten. It was not until 1996 that the historian Jaume Riera and Sans located exactly the building of the old synagogue. The association Call de Barcelona has recovered the building and proceeded to its renovation. In 2002, the major synagogue reopened in the form of a cultural center and museum. To access it, you have to go down stairs about 2 meters below the current level of the street. The building strikes by its modest dimensions: about 60 m2, which agrees with the restrictions on non-Catholic places of worship of the time. 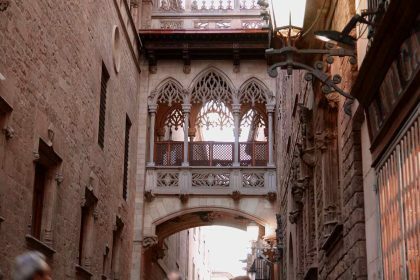 Note that the association offers various complementary activities to visit the major synagogue, such as walks in the Call Jueu, the medieval Jewish district of Barcelona.